First things first, we love children and all the sounds they bring to our life together at WPLC! You and your children are welcome at WPLC. 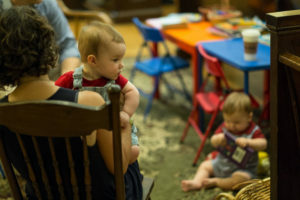 We’re used to the pitter-patter of small feet and the cries of babies – these are the signs of a living congregation with members of all ages. If you’re new to WPLC, here are a few things to help you feel more at home at WPLC. 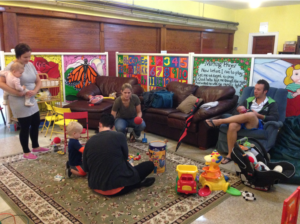 In the worship space, we have two designated areas for faith-based play with children. The south side (by the large stain glass windows) for younger children with rocking chairs for parents; the north side (with the organ) has tables, chairs, coloring books, faith-based reading books, liturgical toys, and more for toddlers. Children are invited to bring items to the pew as well and will probably be invited to help out with some aspect of the service if they’d like. Students from kindergarten through 3rd grade meet in a classroom setting that includes engaging similar texts that parents discuss upstairs in a developmentally-appropriate manner with a craft, prayer, and lots of fun! Students generally begin in the classroom on the lower level at 10 a.m. (see building diagrams here) and will join the congregation after the sermon. Students will sometimes begin upstairs in the sanctuary and the chalkboard at the entrance to the nursery will indicate where to begin. All our teachers have completed a background check and basic training. Two adults will be present in the education area. We have the high-energy and experienced team of Anna Locke, Anne McCall, and Lindsey Bolton leading the classroom. Sunday School Enrollment Form – We take your child’s safety seriously at WPLC. All parents/guardians are required to complete an enrollment form before your child attends Sunday school. We have forms available on site, or you can download the form here and bring it with or e-mail it to office@wickerparklutheran.org. Children up to age five are welcome to play in the nursery (see building diagrams here) with their parents or with our paid nursery attendant during most services. Our nursery attendant comes with years of experience and is CPR/first aid certified for children and infants. We ask that parents/guardians complete the “Nursery Information Form” if a parent/guardian does not remain in the nursery. You will be asked to sign in/sign out your child each time but the information form only needs to be completed once. We have forms available on site, or you can download the form here and bring it to the nursery or e-mail it to office@wickerparklutheran.org.